Mountain biking in Costa Rica is one of the easiest ways to see everything this beautiful country has to offer! Whether you’re an adrenalin junky or someone who hasn’t ridden a bike since childhood, The Real Deal Tours has an Arenal Mountain Biking tour for you. Costa Rica is surrounded by nature with hundreds of miles of roads and hidden trails designed for all levels of riding. You may find yourself sharing the road with an Iguana while taking in breathtaking views of volcanoes. While riding past exotic fruit orchards, coffee plantations and over river crossing, your mountain biking guide will share all the secrets within the rainforest and maybe even point out a monkey or two. Mountain biking allows you to ride like the wind and become one with nature! 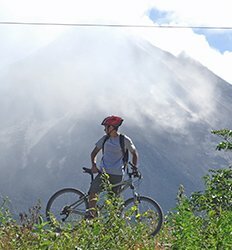 Book your discounted Arenal Mountain Biking tour today! 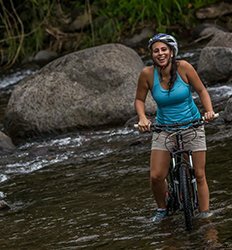 If you are looking for a fun bike tour around Arenal and a chance to experience this beautiful region of Costa Rica at a more relaxed pace, this is the ride is for you! Begin your two wheeled adventure into El Castillo, where local wildlife abounds and the people live in harmony with the land. El Castillo Bike Tour Around Arenal deposit is $15.00 per person. Looking to get out, get a little exercise, and see the picturesque Arenal countryside? Then join us on our Arenal Countryside Biking Tour! With Arenal as our backdrop we’ll bounce along country roads & past real working farms, as the rich display of flora and fauna that Costa Rica is so famous. 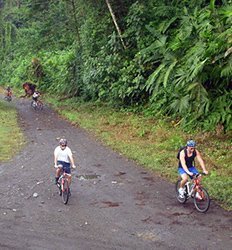 Arenal Countryside Biking Tour deposit is $15.00 per person. Combine two fun activities into one super Eco tour in Costa Rica! Perfect for active families, our Biking & Kayaking Lake Arenal combo is the best way to explore the region by land and sea...or lake! Our well-trained biking staff will first pair you up with the bike best suited for your height and riding ability. Biking & Kayaking Lake Arenal deposit is $5.00 per person.